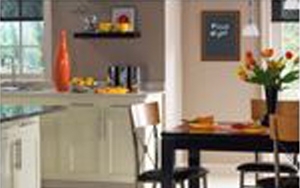 Have fun with colorful chalkboard paint! The traditional blackboard can now be any color you imagine. Create unique wall calendars, to-do lists, tabletops, and much more with erasable, washable chalkboard paint-in any color! Create a charming menu board on a kitchen wall by framing a painted chalkboard square with decorative molding or a painted border. It's a nice touch for family gatherings or when entertaining special guests. Let your kids write and draw on the walls! You can create a canvas for them by painting an entire wallâ€”or a section of itâ€”with chalkboard paint. Best of all, you can make your chalkboard wall any color. Paint plain terracotta pots with chalkboard paint so that you can label them with chalk to identify the plants. 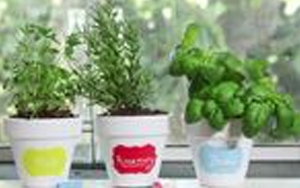 Let the kids help you design a colorful window herb garden or seedling nursery. 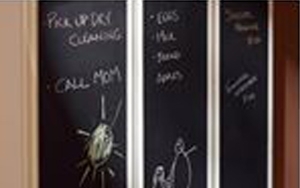 Use chalkboard paint to create a handy, reusable message board for your entire family. Use it as a central location for writing down grocery list items, messages, phone numbers and quick reminders where the whole family will see them. Turn any table top into a chalkboard. 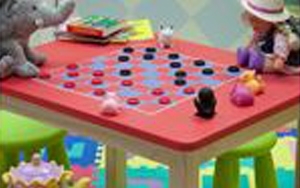 Paint a childâ€™s table with chalkboard paint and add a checkerboard or tic-tac-toe grid. Be sure to keep a container of chalkboard chalk handy. Show the kids how to erase their work with a clean, damp cloth or paper towel. Get more chalkboard paint project ideas.